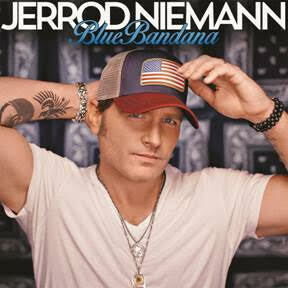 Lovin' Lyrics Music Promotions: JERROD NIEMANN HITS NEW CAREER HIGH WITH "BLUE BANDANA"
JERROD NIEMANN HITS NEW CAREER HIGH WITH "BLUE BANDANA"
Country Radio’s Most-Added New Song Reels in 83 Impact-Week Stations! Sea Gayle Records/Arista Nashville hitmaker Jerrod Niemann set a new career benchmark today with the out-of-the-box success of his single, “Blue Bandana,” which celebrated its official country radio impact date with a tremendous 83 first-week Billboard and Country Aircheck monitored stations on board. “Blue Bandana” not only marks the biggest impact week of Niemann’s career to date, but also earns top honors as Mediabase’s most-added new country song this week. “Blue Bandana,” the first single from Niemann’s upcoming album, was produced by Jimmie Lee Sloas and Niemann and is currently available for sale here: http://smarturl.it/bluebandana.